Unicompartmental knee resurfacing is a procedure that resurfaces the affected inner aspect of the femur and tibia. During the procedure, a small incision is made along the affected knee exposing the knee joint. The damaged portion of the meniscus along with a part of bone may be removed to create space for the new plastic component. The plastic component is fixed into the new created area. Now, the damaged part of the femur along with little bone is removed to create room for the new femoral component. The new metal component is fixed with cement. After fixing the femoral and tibial components the knee is taken through a range of movements. Patellofemoral knee resurfacing is a procedure that resurfaces only the worn-out kneecap or patella and the groove in the thighbone (trochlea). 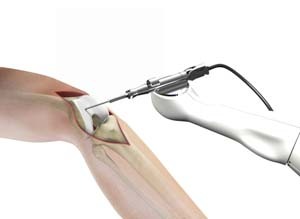 The procedure is performed using an arthroscope, a small fiber-optic instrument with a tiny lens and a video camera. Through the tiny incisions, the damaged part of the patella and trochlea will be removed to create room for the artificial component. The new component is fixed in place with the use of bone cement and the knee is taken through a range of movements.